Home » Uncategorized » Good Timing? Sir William Petty, natural philosopher (mathematician, doctor of medicine and inventor of umpteen ingenious novelties) seems to have mastered the illusive art of time travel! At Easter last year (2015) he appeared briefly at Skipton Castle, and began learning what he could of this far future world. Having managed to free himself from the shackles of time, so that he might move back and forth through the centuries, he did however discover that he had become stuck in space! It seemed his condition was now quite the reverse of that of other humans – they could move in space but were held fast by time. Thus it was that he was unable to leave the chamber he found himself in, and could not go into the town to witness the world himself. 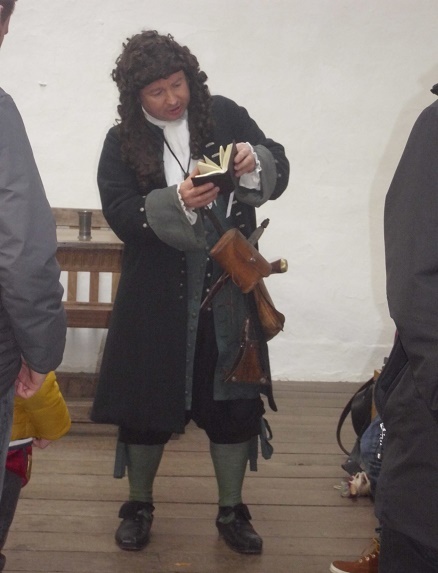 Luckily, a steady stream of visitors came wandering through, allowing him to make queries of a wide variety of people: comparing the marvels they described to his own time, offering them tales of his life in exchange for descriptions of theirs, and connecting the scientific theories and discoveries of their world to those of his Royal Society Fellows from the late seventeenth century. Here you can see him explaining why, amongst a chest of instruments and artifacts he thought he might need, he brought a plumb-line with him (because he thought it entirely possible that the land around the castle might be inundated with flood waters, making just such an instrument necessary to discover the water’s depth). 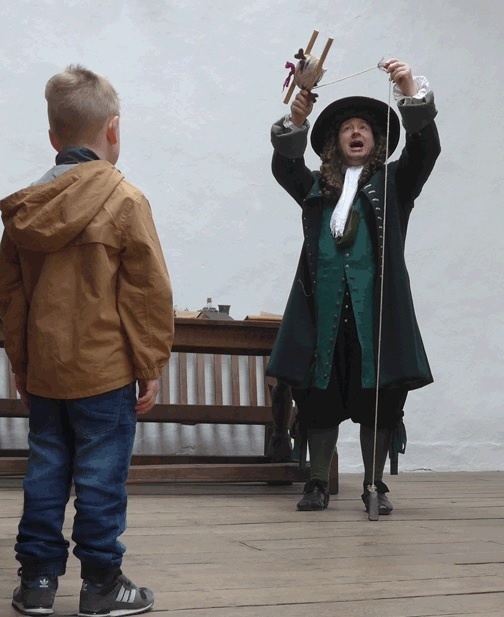 The visitors learned that his chest was packed with a wide range of instruments and objects, from medicines to measuring apparatus, from a plague doctor’s mask to a pistol! Everything he thought he might need if he was to survive in the far future. Although he was dragged back to his own time by the pendulum swing of his secret engine, he managed to reappear at the castle this year (2016) too, now armed with a leather-bound book brimming with many hundreds of questions to ask and investigations to carry out. Here you can see him (still trapped in that same chamber) thumbing through said tome to ask new questions of every visitor he encountered. I don’t think he discovered answers to all his questions, but that is no reflection on the wit and wisdom of the fine and enlightened folk he met, rather due to the fact that he stayed insufficiently long to ask all of them! Many people are now wondering whether Sir William might ever again succeed in traveling through time (whether it be from a later or even an earlier point in his life)? And if so, will he appear in the same or a different place? I myself think it likely that next time, perhaps soon, he could appear in a school!